I originally downloaded Lose it! 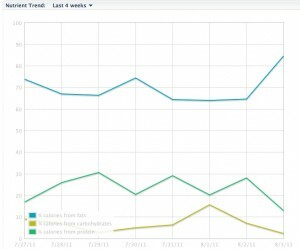 last May when I first started going low carb. I don’t think I used it for more than one or two days before abandoning it for two months. The main reason I stopped using it was because their food list is kind of limited. I couldn’t find myzithria cheese (no matter how I spelled it) or a taco salad without the shell. There are other apps with far greater food lists and I used them. The one thing those other apps don’t have, however, is support. I’m not talking technical support. Quite honestly, Lose It! is so easy to use, I haven’t had to contact tech support. I use both the website and the iPhone app and they work seamlessly together (Hello, WW! Are you listening?! Your app sux!). I’m talking about weight loss support. 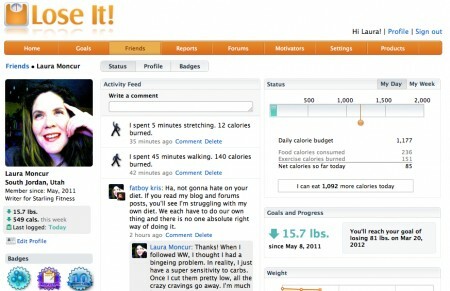 There are TONS of people using Lose It and if you make some of them your friends (and set up your privacy settings), they can see your workouts, your weight losses and your food log. They can give you kudos for getting out there and exercising. They be a shoulder to cry on if you show a gain on the scale. They can even be an inspiration to you when you see that they exercised their butts off when you sat on the couch yesterday. It’s everything that WW promised me about their meetings, but I never got. That’s a bit of a lie. I had one friend at WW and seeing her every week was the only thing that kept me going that last year. I’ve kept in touch with her via email, but I really do miss seeing her in person every week. All the people on Lose It! have filled that void for me. There are so many people using Lose It! that I have been able to find a whole group of friends that are eating low carb. It has been refreshing to have a group of people who eat the same way I do without the constant lecturing about the “benefits” of whole grains and fruit. Lose It! isn’t a program for people following low carb. 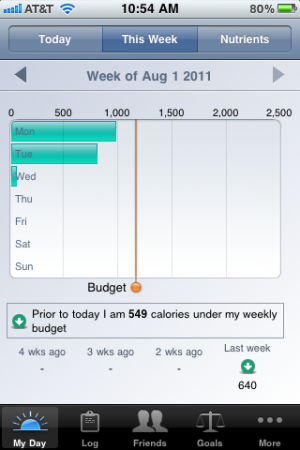 It tracks calories, but it also allows you to watch other macronutrients, so I have it tracking calories AND carbs. Lose It! isn’t about dictating a diet to you, it’s just a tool that allows you to formulate a diet of your own that works specifically for you. I absolutely LOVE Lose It!’s reports. I can analyze my nutrients so that I am sure that I’m eating a high fat, moderate protein and low carb diet. I’ve never been able to do that analysis before, so it gives me a piece of mind to know that I’m on the right track. 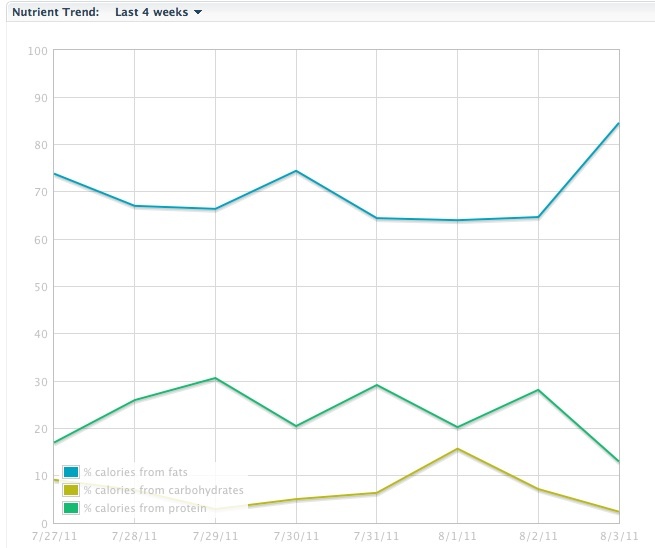 There are many other reports for exercise trends, favorite foods, and calorie expenditures that give a visual reminder to keep on track or change course. I adore how they crunch my data for me so I don’t have to pull out a spreadsheet. And the badges! I love getting little prizes for working toward goals and Lose It! badges are PERFECT for that. I’ve earned a couple of small badges, but seeing all the things I could earn on other people’s profiles makes me want to work harder. 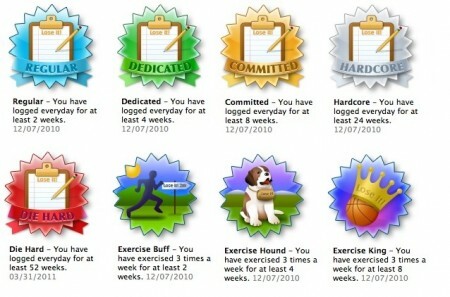 One of my friends had earned these badges and I am on a mission to earn them as well. I love how they reward you for exercising regularly and tracking your food consistently. It’s so inspiring to me! Once I’ve earned those badges, I can order a t-shirt with one of them on it. When I get that Die Hard badge, I’m definitely getting a t-shirt. Oh, and the Goal Achieved badge, too. 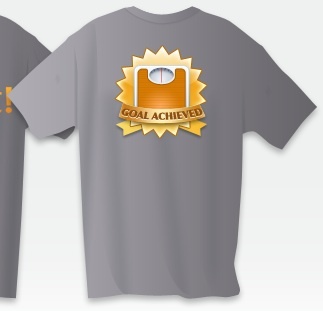 In fact, I’ll have to order a t-shirt for the Exercise King badge, as well. I can’t wait until I can do that! Of course, if you’re shy about sharing your information, Lose It! has privacy settings that allow you complete secrecy. Your friends can only see what you allow them to see, and the rest of the world is blind. Or the entire world can be blind to you. You have that option and I love Lose It! for it. In the end, I have been extremely happy with Lose It! If you feel like your diet is getting a little stale, log onto their site and see if it helps you as much as it has helped me. Update 09-20-11: I’ve found two more badges that I’d like to earn: The Pool Shark and Om badges. 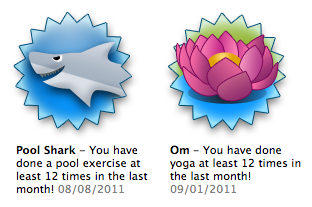 Of course, neither of them have gotten me to swim or do yoga yet, but they are even more badges that I can work toward. Next: MOVE Makes Me Want To Move!